"Norway. 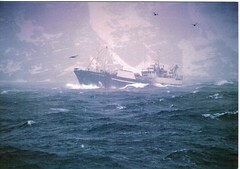 Storm off the coast of Finnmark"
A Postcrossing postcard from Britt in Norway. I don’t know the name of this ship, but Finnmark is a region of Norway on it’s extreme north coast, way above the arctic circle. I don’t imagine it would be very pleasant to be in a storm there. Thanks for the postcard, Britt!